Photos by Liz Martiniak © Liz Martiniak 2002; all rights reserved, and Kurt Lemke ©Kurt Lemke 2013, all rights reserved. ABOVE (Photos by Liz Martiniak) Top: Spendthrift Farm cemetery. Second Row: Memorial to Nashua (left); Raise a Native (top) and Gallant Man (bottom). Middle: Prince John's grave (left), grave of Creme Dela Creme (right). Founded by Leslie Combs II and named for the racehorse SPENDTHRIFT, who was owned by Combs' ancestor, Daniel Swigert, SPENDTHRIFT FARM was one of the most important farms in the 1960s and 1970s. The earliest grave here is for *BEAU PERE, the first horse Combs syndicated, but who died before he could cover mares at Spendthrift. Combs' landmark syndication came with NASHUA, purchased from the Woodward Estate. The stallion barn became known as "The Nashua Motel." 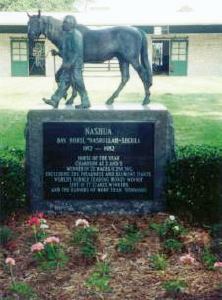 Buried near the stallion barns are some of its greatest residents, including NASHUA, whose grave is marked with a bronze statute. Others here include RAISE A NATIVE, his sons EXCLUSIVE NATIVE (sire of AFFIRMED) and Spendthrift-bred MAJESTIC PRINCE, who won the Kentucky Derby and Preakness Stakes. Other important stallions who rest here include Belmont Stakes winner *GALLANT MAN, NEVER BEND, CARO, PRINCE JOHN, and FLEET NASRULLAH. Mr. Prospector was bred at Spendthrift Farm, and four generations of his female line are buried at the former Old Kenney broodmare division (now known as Green Gates Farm), including his dam, GOLD DIGGER, granddam SEQUENCE, great-granddam MISS DOGWOOD, and great-great-granddam MYRTLEWOOD, a sprint champion and Combs' foundation mare. 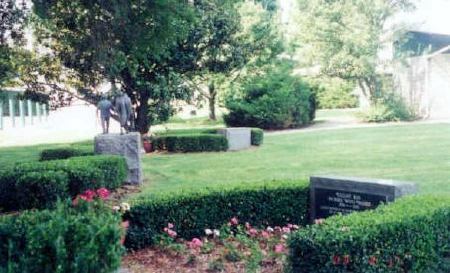 MYRTLEWOOD is believed to be buried in the rose garden at the former Combs residence at Spendthrift. -- A.P.